I’ve finally gotten myself down to only one Trader Joe’s shop a week. However, I am still working on buying enough at one time to last us until my next shop and of course, I always forget something! The most important thing that I forgot this time was the frozen organic pizza crusts. My son LOVES those Trader Joe’s pizza crusts. I thought we still had a package left in the freezer. Oops. I also failed to get a watermelon but that was more a conscious choice. Even though I needed watermelon and the price was $2.99, I was feeling lazy and didn’t want to carry it or cut it up. Ah well. I can’t really say that I buy anything too exciting lately. Right now, I am still going through my I don’t care what I eat phase. We aren’t meal planning, we are eating out a whole lot and I am not thinking ahead to purchase foods I might be interested in cooking. In some ways it’s a fun way to live and in other ways, it’s not. I never really know right now what I will have for dinner and sometimes that can be a little frustrating. However, I am just going to ride this phase out until something inspiring starts to kick in again. Forgot the organic pizza crusts! 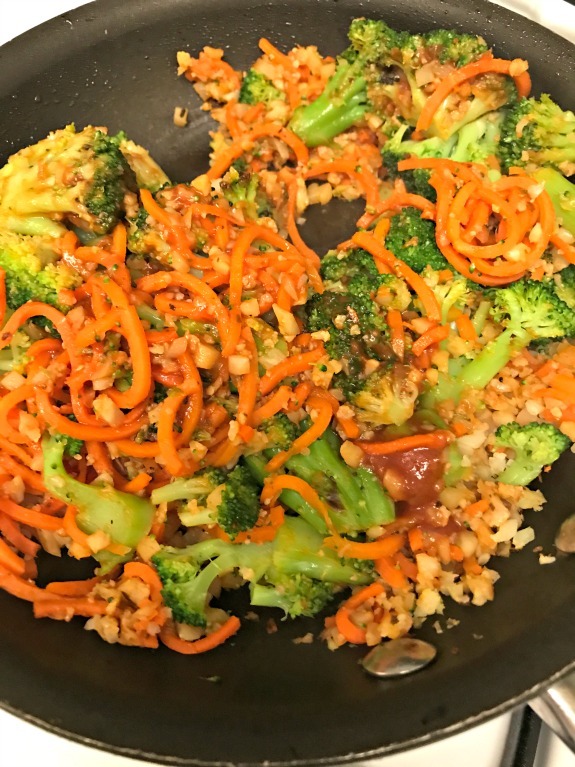 I wasn’t quite sure what I would do with the frozen organic riced cauliflower but I ended up throwing it in a pan with the frozen spiralized carrots (that I still had in my freezer), frozen broccoli and tomato sauce. With the addition of oregano and crushed red pepper, it really turned out to be a good meal for myself. Once it all cooked, I added mozzarella cheese. It was really a delicious, quick dish that I see myself repeating quite often going forward. You should also know that I bought a container of jicama sticks and snacked on them while shopping at Trader Joe’s. I am the queen of opening food while still in the grocery stores and I have no shame in doing so. Let’s talk quickly about the Everything But The Bagel Sesame Seasoning Blend. I know I promised to share my favorite ways to use it so here we go. Sprinkled into mashed avocado as a veggie dip. As seasoning for vegetables and/or potatoes that I am roasting in the oven. Sprinkled on salads for added flavor. Mixed into chopped meat as seasoning for hamburgers (my son liked the burgers, I didn’t taste them). Added to any type of veggie mix that I may be cooking on the stove. ** I don’t eat chicken and I don’t cook it often for my son but I am convinced it would be delicious on grilled chicken if I were to make it. 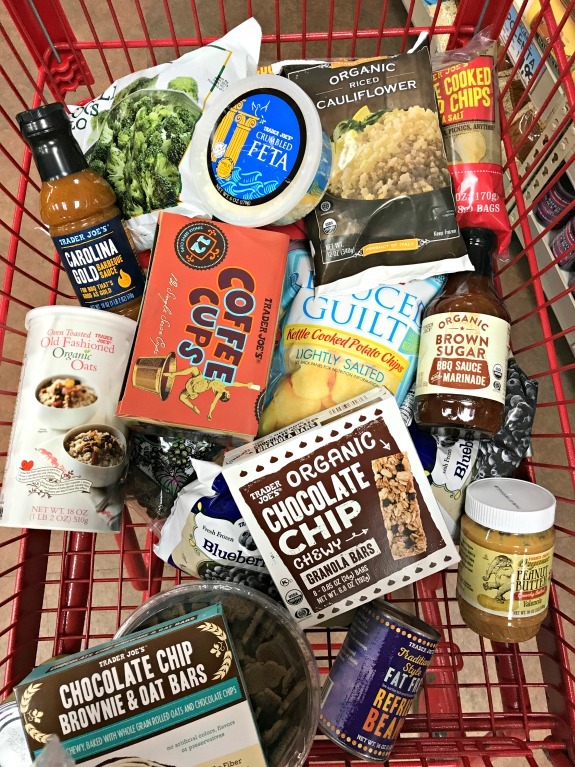 What’s In My Trader Joe’s Shopping Cart? 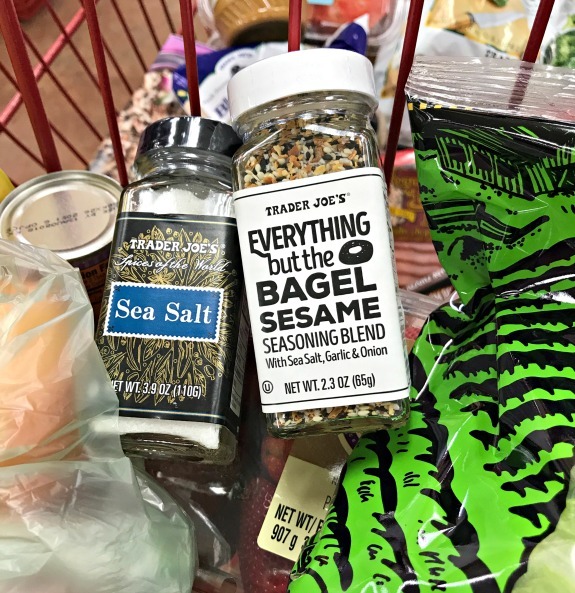 Do you use the Everything But The Bagel Sesame Seasoning blend? What do you think of it? How do you like to use it? Are you a weekend or weekday food shopper? Have you bought the frozen riced cauliflower? How do you like to use it? We always get groceries on the weekends but the few times Ive gone to TJs during the week its been so crowded! I do love going once in awhile to see what they have. There are a few things I get there that I cant get anywhere else! whenever I go it’s crowded! My husband and I were literally talking last night about how to use the everything but the bagel seasoning, thanks for the great ideas! 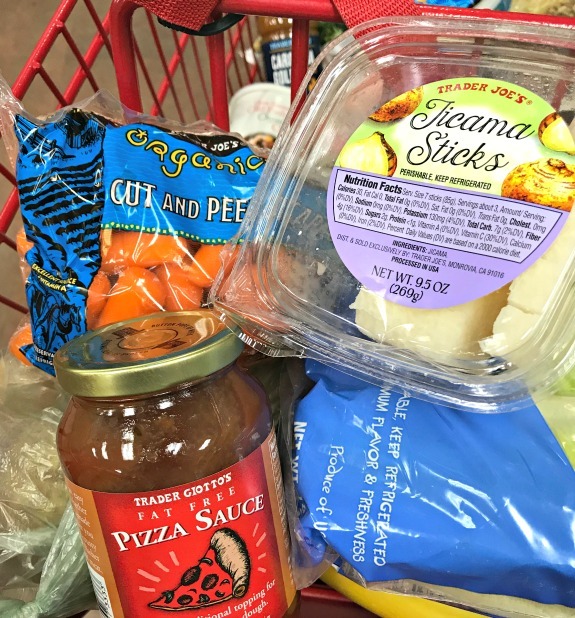 I love trader joes and always love seeing what other people get there. great! let me know if you try using it another way too! This post made me feel so much better about this season in my life. I walk through the supermarkets and everything is in such big packages. I don’t always want to buy 8 servings of something. My husband and I eat completely different. I eat plant based and he eats like your son. I find it so hard to plan ahead bec I never know what I will feel like meal-to-meal, day-to-day or even where I will be. I guess that’s why frozen veggies work so great for you because they aren’t perishable and you have them when you want them. I love black rice and roasted veggies. I need to step up my game, but this weather leaves me unmotivated in that department. Stay cool. Today is going to be very humid. it’s already brutal out there! I could barely make it 3 miles this morning! Love the idea of using the spice with avocado! Sounds like it would be perfect on some toast. I still haven’t tried it but I think next time I go I have to pick it up! definitely try it! I think you would love it. We live 2 hours away from Trader Joe’s, so when we make it to one, we tend to spend a ridiculous sum. Those brownie oat bars in your cart are one of my 4 y/o son’s favorite things in the world, so I think we bought at least 10 boxes last time! I also picked up some of that everything bagel seasoning, and yes, it ROCKS when paired with avocado (I had it on avocado toast). Also good on mac and cheese. Must try on mashed potatoes. Like the idea of a veggie dip, too—blended with plain yogurt and cream cheese? We do the bulk of the shopping on weekends, but there’s usually at least one stop during the week to replenish the bananas. Apparently, we are a family of monkeys. my son loves those bars! I need to buy more than a box at a time I think! Wow, I’m thinking that this Everything but the Bagel Seasoning is probably the most popular seasoning I’ve ever seen. I wish we had TJ’s close to us, but if I go someday again, I would definitely try to buy a bottle. Also, I know what you mean by just not feeling inspired to cook; it’s okay. Simple is good too. I don’t like everything bagels so I’ve been hesitant to buy the seasoning, although it looks yummy. I’ve made Spanish rice and fried rice using the cauliflower and they are both delish. I saw try the seasoning anyway! it’s a little different than an actual everyting bagel although read the bottle to see if you like what’s in it. I so wish I could get my mitts on that seasoning blend! DAMN CANADA. somehow you have to get it to try it! I’m a weekday shopper, but inevitably we end up at the grocery store at least once on the weekends for something. I keep seeing so much about this Everything but the Bagel Blend that I may need to try it the next time I’m near a Trader Joe’s! you definitely need to try it – I think you would love it. Thanks for answering my Instagram question, Meredith! I’ve actually used it also so far in eggs and salads, and I’ve been loving it! any time! Eggs are a great idea for this seasoning! I haven’t been eating eggs lately so I didn’t even think of that. I will try it for my son – I think he would love it. I think the Everything But the Bagel seasoning would be delicious on and in almost everything. Definitely chicken and I don’t eat it either. I don’t meal plan much either and sometimes it’s freeing and other times it’s frustrating. Thankfully the kid is a good eater so I can get away with it.